Using pragmatic actions on the floor to move from one point to the other, this durational performance locates a performing body and its viewers in relationship with the wall, floor and ceiling. Positioning a human body as moving architecture, it exhibits a spatial occupancy of human body in time. Presented at Bodyvox North Wing in Portland OR in December 2011. 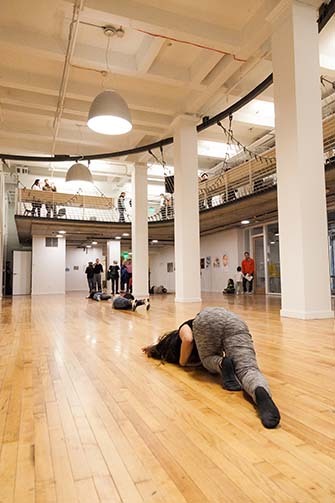 March 2015 performance featuring movement artists(Stephanie Brachmann, Nicolo Gentile, Jung Min, Katie Piatt, Michael Reinsch, Stephanie Yu, and Takahiro Yamamoto), sound artists (Val Gayevskaya, Ben Gas, Justine Highsmith, and Anita Spaeth), and text artists (Thomas Gamble, Linden How, and Travis Nikolai).